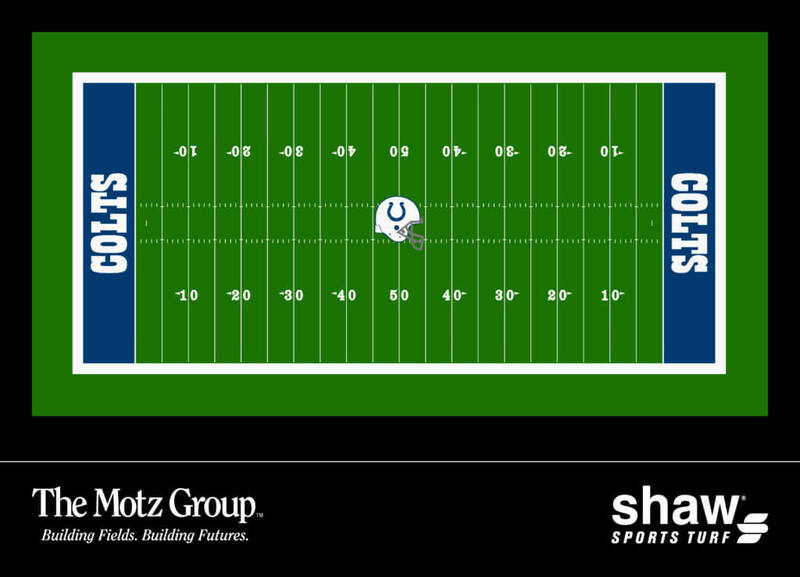 The Indianapolis Colts have officially teamed up with The Motz Group, and their turf manufacturing partner Shaw Sports Turf, to deliver a state-of-the-art synthetic turf system. This new high-performance sports field will be installed at the Colts’ training facility, Indiana Farm Bureau Football Center, in preparation for the 2018 season. The Motz Group and Shaw Sports Turf make up a team that is globally recognized and locally based. Headquartered only 100 miles from Indianapolis, Motz has more than four decades of experience delivering world-class sports field systems, specifically designed for professional-grade venues and athletes. Motz is the best sports turf professional for the Colts, offering an unmatched service and maintenance program, expansive product portfolio, and a high-profile client roster spanning five continents. In addition, Motz has provided 18 synthetic turf surfaces to Grand Park Sports Campus, one of the largest athletic complexes in the nation and the official home of the Indianapolis Colts Training Camp. The Motz Group has officially kicked off the transformation at the Indiana Farm Bureau Football Center. The Indianapolis NFL team will be in good company, joining other professional sports clients such as the Atlanta Braves, Baltimore Ravens, Cincinnati Reds, and also just completed for the 2018 season, Cincinnati Bengals. “The Motz Group is honored to have been selected by the Indianapolis Colts to provide their newest synthetic turf surface. For more than 40 years, our team has been dedicated to providing world-class turf systems that are engineered and proven to be the best in performance and playability. This, combined with our commitment to superior service throughout the life of their fields, makes Motz the perfect fit for the Colts,” shared Zach Burns, President at The Motz Group. About The Motz Group: The Motz Group has been building world-class sports fields both nationally and internationally for over 40 years. They’ve earned their global reputation with trailblazing innovation and an uncompromised commitment to quality. Motz specializes in high-performance natural and synthetic sports field design, construction, removal, replacement, maintenance and management. Athletes have competed on Motz’s surfaces in the NFL, MLB, NCAA, Olympics and even the World Cup. Their globally recognized products include the world-renowned hybrid turf system, Eclipse® and the comprehensive natural grass root zone management system, AirPAT®, as well as a line of pro-grade synthetic turf products. For more information, please visit www.themotzgroup.com or call 800-871-3992.